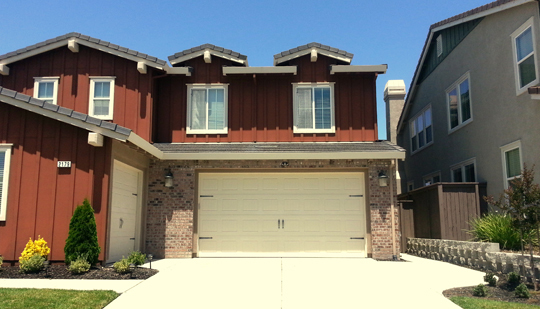 You are here: Home » Blog » Why Choose a Single Panel Garage Door? Why Choose a Single Panel Garage Door? Probably the oldest style of garage door, aside from side hinged doors, is the single panel “up and over” model. Although waning in popularity, this type of garage door is still widely available and does have a number of benefits. So in this post, we’ll look at the reasons why you might choose to install a single panel garage door in preference to the more common sectional type. Perhaps the most compelling reason for choosing a single panel garage door is a matter of budget. This type of door is inexpensive to buy and, due to its simplicity, to install. There are two types of single panel door, the canopy type, and the retractable type. Of these, the canopy style of garage door is the most affordable. In terms of reliability, the single panel, up and over door wins again. The simple mechanism and construction means there isn’t too much that can go wrong and if you should have any problems, replacement parts are relatively inexpensive. The nice thing about single panel doors, especially when they are closed, is their aesthetic appeal. Choice of available materials is extensive and these garage doors can come with a paneled or textured appearance. They also lend themselves to the installation of glazed panels for a homely look. Availability in a range of standard heights and widths, single panel garage doors can be fitted to most garages, although they don’t lend themselves to unusually shaped Garage entrances. The slightly more expensive retractable doors can easily be fitted with automatic openers. This can often be a good idea, as these doors do tend to be harder to manually open and close than sectional or roller doors. When it comes to home security, your garage is a potential entry point for intruders. Thieves like to break into garages because they can close the door and then work on your home’s interior door while remaining out of view. A single panel garage door has a design, which makes life difficult for burglars. These doors are hard to get past when securely locked. Most single panel doors have multiple locking points for added protection. The retractable type of up and over door adds a few more benefits while still being affordable. This type of door doesn’t extend so far past the garage entrance aperture when opening, so vehicles can be parked a little closer to the garage. The door retracts completely into the garage roof space, which makes for a less obtrusive look when the door is open. Finally, it lends itself to automation, which can’t be said of the canopy type. Although a little clunky to open and close, single panel, up and over garage doors are still a popular choice, particularly for homeowners on a budget. Available in wood, steel, ABS plastic and GRP, there is a single panel door to suit most styles. A vast range of decorative designs is offered by suppliers, making these garage doors a low cost way to beautify your home’s exterior. 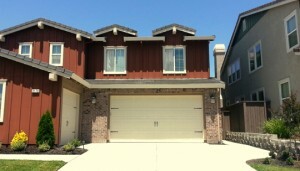 This entry was posted in Blog and tagged garage doors, single panel. Bookmark the permalink.